You might think that a man who has authored several books, serves on several boards, was at one time known as an intellectual and a poet, and who eventually became president of Denver Seminary, might be intimidating and high brow. Not Vernon Grounds. 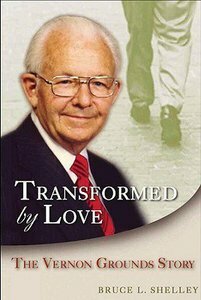 In Transformed by Love, you'll discover a man who has earned the love and respect of all who know him, who persevered through some of the most turbulent years of modern evangelicalism, and who is a role model for living out faith, hope, and above all, love. Includes photographs. Dr. Bruce Shelley (PhD.,University of Iowa) is Senior Professor of Church History and Historical Theology at Denver Theological Seminary. Among his publications are The Church: God's People; Evangelicalism in America; Church History in Plain Language and The Cross and the Flame.